Palazzo Pizzo - Dependance Delle Grazie (sleeps 2-6) with stunning sea views in the old town of Pizzo Calabro. The newly renovated "Dependance Delle Grazie" is our largest apartment and is located in the same house as our "Studio Bellavista". The apartment is on the upper floor with two levels and a spacious and bright floor space of about 125 sqm (1,345 sq ft). 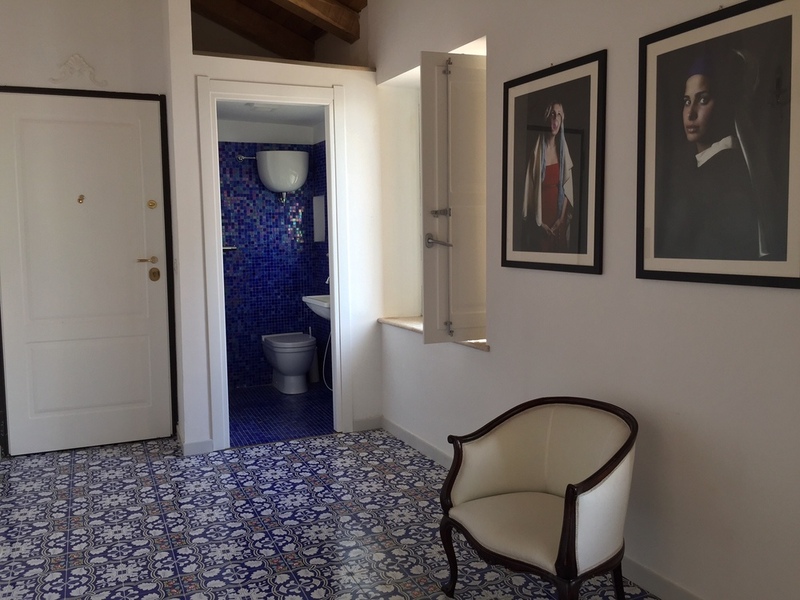 The interior is furnished in contemporary and antique style with Mediterranean floor tiles and wooden parquet. The walls are decorated with artworks from three local artists. From the balconies and the private roof terrace you can see the Castello Murat, Pizzo Marina, the beach, the sea and stunning ever changing sunsets. From here it's just 50 meters down the street to the lively piazza with a good choice of bars, shops and restaurants, and a 10 minutes walk to the beach. The Dependance sleeps 2 to 6 guests. The entrance to the Dependance is a few steps up a staircase on the first floor. There are two private bedrooms. The large master bedroom has an ensuite bathroom and a small balcony facing the street. The second smaller bedroom has a balcony with sea views and is furnished with a single bed that transforms into a queen size double bed. A sofa bed and a work desk are upstairs at the galleria under the roof and can be reached from the stairways in the living room. The private rooftop terrace offers stunning views over the sea, the piazza and the roofs of the centro storico and Pizzo Marina. The balconies of the living/dining area and the kitchen are facing the sea as well. On clear days you can spot the active volcano Stromboli, which is part of the Eolie island group of Sicily in the Tyrrhenian Sea - which makes the sunsets even more spectacular. During the renovation natural stone walls were discovered and preserved as well as some wooden beams and ceilings. We used special material and double windows for insulation. You can reach the Dependence by car in about 30 min from Lamezia international airport (SUF). The Piazza della Repubblica, the main piazza in the historic centre of Pizzo, is less than 1 minute walk away. From the Dependence to the beach at the Marina it is just a 10 minutes walk. Everything you might need during your stay is within walking distance: bars, restaurants, fresh market and shops. You actually do not need a car while in Pizzo. From April to October there are usually "Ape"-taxis connecting the different areas of Pizzo - which are La Marinella, Piedigrotta, Centro Storico, and La Marina. If you want to rent a car, the nearest car rental agents are at Lamezia airport. Scooters can be organised to be dropped and picked up in Pizzo (from Parghelia / Tropea). If you want to book a car park please contact us in advance. From Pizzo you can explore and discover the beautiful Costa degli Dei, the "Coast of the Gods" - with its crystal clear, turquoise sea and many different beaches, as well as the many little villages with Greek history, scattered over gentle Calabrian highlands with thousands of olive trees and forests. See our section about Calabria. The Dependence sleeps 2 - 6 persons. Please note, no pets are allowed. The Dependence is not suitable for small children and people with restricted moving ability. No smoking inside, only outside on the terrace. We can organise for you a pick-up service from the airport or train station at extra charge. Please let us know asap. - Please contact us at least 2 - 3 days prior to your arrival to agree on a key-hand-over-time. Check-in is from 15.00 to 21.00. Many thanks and see you in Pizzo! Want to know more about Pizzo? What to do and where to eat? Check out our Pizzo guide on this website. We will also send our guests an updated guidebook in PDF file via email as well as provide a copy at the residence. Want to discover more places in Calabria during your holiday? Travelling by car or by train, check out our tips for day trips around Calabria here. Want to go to a different beach every day? In our "Pizzo guide" there are listed some of the best beaches within 5-30 min drive. The closest beach is a 10-15 minutes walk from the residence, below the castello at La Marina. Want to know what other guests think about their stay with us? Please have a look at our Guestbook. Want to get to know our team before arrival? .... read more. You are interested in our renovation project(s) in Italy? Here you can find a summary and further links. Do you still have a question? Please contact us, we are looking forward hearing from you.